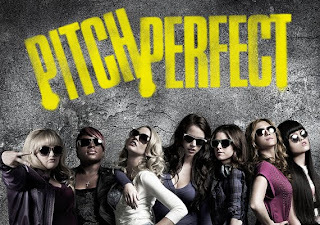 I'm sure you've heard all about it by now, but today, Pitch Perfect, the hot, rotten-tomatoes highly rated film by Penn film producers Elizabeth Banks (C'96) and husband Max Handelman (C'95, AEPi) comes out! If you recall, in an interview she did promoting the film, Liz had referenced a Penn a capella group from her time at Penn that she thought was "the most amazing version" she's ever heard in her life. On a related Penn alum note, Melisa Kirkup (C'01), Universal Pictures marketing director shared a 60-second lip-dub Pitch Perfect video her team produced, featuring the hit Nicki Minaj song “Starships”! "In the new out-loud comedy “Pitch Perfect,” Beca (Anna Kendrick) is that girl who’d rather listen to what’s coming out of her headphones than what’s coming out of anyone’s mouth. Arriving at Barden University, she finds herself not right for any clique but somehow is muscled into one that she would never have picked on her own: alongside mean girls, sweet girls and weird girls whose only thing in common is how good they sound when they sing together. The movie also stars Skylar Astin, Rebel Wilson, Adam DeVine, Anna Camp, Brittany Snow, Alexis Knapp, Ester Dean, Hana Mae Lee, with John Michael Higgins and Elizabeth Banks."